When it comes to the newly rebooted Amazing Spider-Man series, I sometimes feel like someone in the midst of the “five stages of grief” – trying to work my way through each stage until I finally (inevitably) hit upon “acceptance” and understand that eight issues in, this book continues to disappoint me. And maybe that will still happen (still bargaining). But Amazing Spider-Man #8 was just another lackluster effort, specifically in the writing department from Dan Slott – someone whose work I once found myself defending against some of his most vile critics. Someone whose talents are still clearly on display in Silver Surfer. But month after month (or every two weeks, after every two weeks) since April, I find myself getting to the end of ASM and saying to myself, “and … ?? ?” What is it going to take to get a story out of this book that leaves me smiling and excited to be reading Amazing Spider-Man? ASM’s current lack of soul and heart is made even more apparent after the release of the Edge of Spider-Verse mini which saw five lesser-known creative teams throw everything they could at readers in their one shot to sell a brand new Spider-Man from across the multiverse. Or in Superior Foes of Spider-Man, where the creative team is ending the series in spectacular fashion. These are books that are making ASM eat its lunch right now and there’s no legitimate reason for that to happen. ASM is a book with an “A” list writer in Slott and a great cadre of artists in Humberto Ramos and Giuseppe Camuncoli (who continues to get better and better every issue out). This book should be stellar and it’s far from it. My biggest critique with ASM #8 was its meandering narrative which inevitably led to one of the more tepid reveals in a series that seems to be specializing them lately. In a continuation of last issue’s Spider-Man/Ms. Marvel team-up, the book committed two cardinal sins in superhero comic storytelling: it was light on plot and light on action. 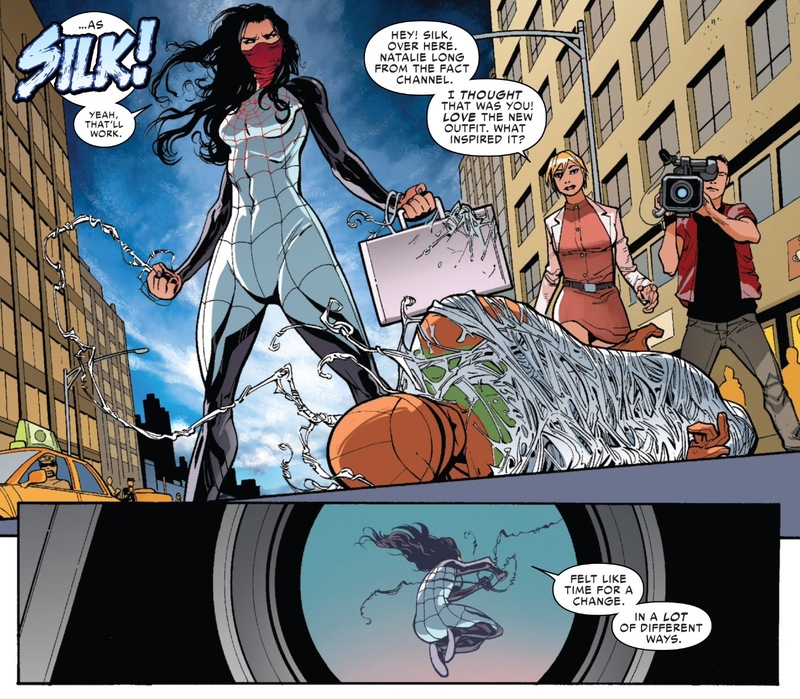 Certain character beats were repeated from an issue ago (like Ms. Marvel’s awestruck-ness around Spider-Man), while the more progressive plot advancements were saved for characters not named Peter Parker like Silk’s new costume (which was essentially spoiled a few weeks/months ago for the advanced solicits for the new Spider-Woman and solo Silk series). Such ho-humness is acceptable if the story ends in a fashion that is compelling/shocking/outrageous/all of the above, but instead the seemingly big build-up was to unveil one of Dr. Minerva’s henchmen as Clayton Cowles, aka “Clash,” who was first introduced a few months ago as part of the very disappointing “Learning to Crawl” miniseries. Putting aside the fact that I was non-plussed by how the character was developed by Slott during “Learning to Crawl,” his “re-introduction” after what was supposed to be more than a decade in comic book time, was far from ideal. After he unmasks himself and proves that he’s not some kind of monster to Ms. Marvel, Spidey basically goes up to him an says “hey I recognize you. You’re Clash.” Kitty Pryde stumbling upon Colossus in the laboratory during Josh Wheedon’s Astonishing X-Men this ain’t. We do get a bit of exposition that explains that Spider-Man made the connection from the sonic blaster Clayton used during their battle, but it’s still a fairly flaccid way to bring a long-absent character back into the storyline. 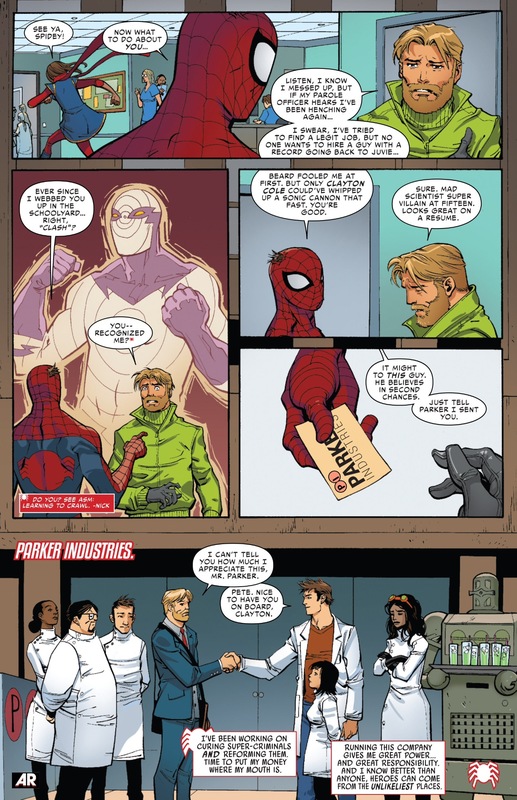 Peter wanting to give him a second chance at Parker Industries is a nice sentiment, but considering the story Slott just finished telling barley a month ago, one would think that a reunion between these two characters would be far more emotionally charged then the “hey, what’s up?” exchange we ultimately got. But that’s been Amazing Spider-Man in a nutshell these past few months. ASM #8’s “B” story, which is all but guaranteed to rile up a certain segment of the fan base, didn’t leave me outraged as much as it left me feeling apathetic. I know that Spider-Girl has a very passionate and protective fan base, but similar to the big Spider-Man and his Amazing Friends reveal last issue, the recurring violent destruction of all of these alternative Spider-Men registers less and less each time out. 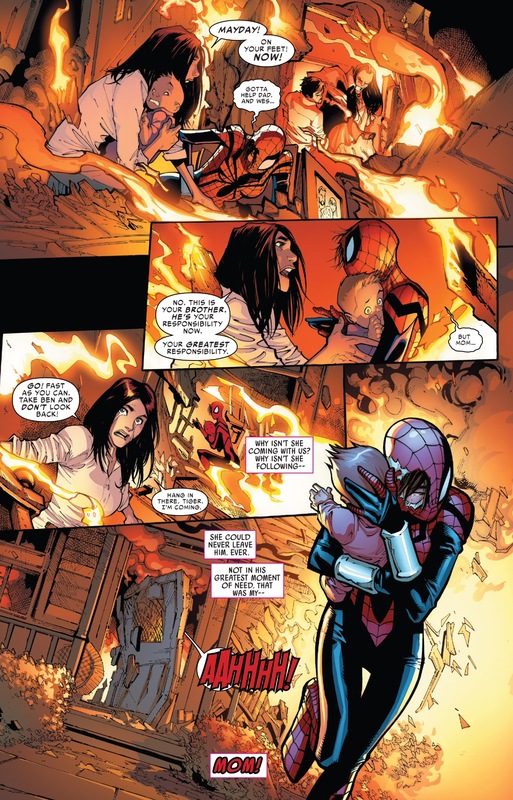 Which is a shame because based on the cult popularity of the Spider-Girl universe, ASM #8 could have really landed an emotional wallop if the whole thing wasn’t so telegraphed. I will, at least, admit that I look forward to seeing whether or not Spider-Girl gets her revenge on Morlun, as this is a character I am rooting for to succeed. But wanting to see a happy ending for Mayday Parker might just be another instance of me bargaining with the comic book gods to give me something – anything – to latch on to and be excited about. I was recently asked what my favorite comic on my pull list currently is, and based on the fact that Superior Foes is ending, I shockingly found myself say Batman. That’s right, I think one of the few “Distinguish Competition” books that I read is better than Spider-Man right now (or really any Marvel book, though Surfer, Daredevil and Rocket Raccoon are all great right now). What I would give to have a different answer, but maybe I just have to accept that’s the case right now. lol, I think you mean the five stages of grieving, not a 12-step program. Although I can certainly see how ASM’s dropping quality could cause you to acknowledge and submit to the will of a higher power (presumably in this case Satan). LOL, you are correct. Thanks for the heads up. I really agree with your last few posts about Spider-Verse thus far. I think once it starts it’ll be interesting for sure but I do totally understand the hate that Slott gets for thinking that an emotionally gripping story involves the death of a beloved character. It’s become a running gag on his own Twitter: “I just killed another major character today”, he posted sometime ago, demonstrating that he too thinks killing off spider characters and watching Peter and us react is what makes the story and is also old hat. The backup story in issue 8 isn’t sad. It’s angering and perhaps that’s on purpose since angry fandom usually buys more of a comic not less of one. This was from the perspective of a fan that loved the MC2 line of books. I don’t know though, I walked away from ASM #8 feeling quite apathetic where I was once super excited when Spider-Verse was announced. Slott said before that we don’t want a happy Spider-Man because it’s like if Charlie Brown finally was able to kick the football or if Wiley Coyote finally caught the roadrunner. We’ve seen this theme over and over again. House of M Spidey who winds up with Gwen gets murdered by Karn. Then of course MC2 Peter dies and MJ is killed too…when really Spider-UK and Last Stand Spidey for all the futuristic tech they have at tracking Spider totems could have arrived 5 min earlier since presumably they have the ability to travel across time and saved everyone. It’s gloomy. The Spider-Man world feels so gloomy right now. Also, I’m still trying to figure out the rules of the interdimensional / space / time travel. The overthinking of it plagues me with every turn of the page currently. It’s become distracting and is taking away from the story for me. For ex., if Last Stand Spidey gets killed in Spider-Verse, (which I kinda see happening for some reason), what does that mean for ASM #500, where he was already killed? Does that just change that entire reality? Because if he gets killed now, then he can’t go back to his world and if he can’t go back to his world than he never gets killed in ASM #500. Unless of course that’s an alternate alternate Last Stand Spidey we saw in ASM #500. Which, if that isn’t explained to your readers, makes no sense. Suffice to say, there’s many potential pitfalls in a story so large in scope and if this is really one big slaughter fest of all the Spider-Men, then I wonder if Dan himself is still having fun writing the book. Shock value is going to burn out pretty quickly for readers. So here’s the thing for me, I’m not hating ASM at the minute (this issue was fine, just a bit dull), it just feels incredibly lack-luster. The thing I’m really struggling to get past is that it feels like a huge wasted opportunity. Superior was, at least at the start, exciting because I really didn’t know what was going to happen. Between issues I was constantly checking online to see if there was any clues as to where things would go next and it felt like this was a fantastic chance to create some long lasting changes to the character, in a fluid and interesting way. Not by keeping Ock as Spider-Man forever, but for the amount of interesting ways this could have effected Peter on his return. Instead, seemingly the only real carry-over from Superior are Parker Industries and Anna-Maria (who’s a welcome addition). But it’s not like these are proving to have much impact on the central character. Maybe I’m just clinging to my own ideas rather than accepting what’s actually going on in the comic, but still, it feels a bit outdated to have to press the reset button at the end of each storyline these days (even one that lasts as long as Superior did). It’s like a 90s TV series, before programs like The Sopranos came along, where the end of each episode has to re-establish the status quo, whist still pretending that each new plot will bring about some dramatic shift in the currant dynamic. While this doesn’t address all of the very good points you made, I think what we’re ultimately witnessing here with ASM is the results of Marvel’s “event driven” narrative gone amok. By that I mean, based on many reports, Slott wanted to run “Spider-Verse” during the height of Superior and was vetoed by editorial as it needed to be a “Peter Parker story.” The end of Superior/start of ASM was completely inorganic in large part because the timing was shoehorned to coincide with The Amazing Spider-Man 2 film (which ended up being a semi-flop), and to top it off, some semblance of an “Original Sin” had to be tied-in to the book as that’s what everyone in Marvel was doing at the moment. As such, Slott has been unable to tell a straightforward narrative in months. 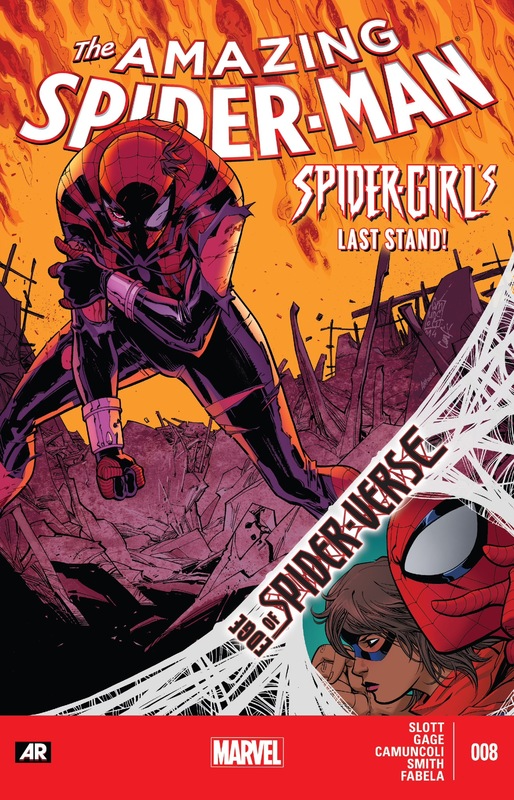 I actually thought the first issue back in April was a good start in addressing some of the issues you described, but that was quickly abandoned to work in an Electro plot, Original Sin, and then suddenly Spider-Verse prologues. That’s part of the reason why I’m not ready to formally write off the book’s creative team until I read Spider-Verse as I feel like this will be the first time in forever that Slott gets to tell the story that he wants to tell without conditions (though he’s already had to build it around Peter, and with Spider-Gwen being so insanely popular, one has to wonder if suddenly she’ll play a bigger role than originally anticipated). The fact that Slott’s two Superior issues over the summer were two of the best Spidey comics he’s written this year gives some credence to my theory. But overall yes, your entire thesis is true. Opportunity was wasted. I guess I’m hopeful for some level of recovery, but we’ll have to see.